A high-octane action game overflowing with raw brutality, hard-boiled gunplay and skull crushing close combat. Breakneck gunplay in bloodstained neon corridors combined with an intense, pumping soundtrack. A surreal and gritty storyline panned out over 20 brutal multi-level maps. Heart-stopping battles against a bizarre cast of bosses from Miami's underground. Wield 35 different weapons - from shotguns and assault rifles to katanas and lead pipes - everything is at your disposal. Over 1,000 different sprites for a fantastic variety of environments, weapons, items, and enemy death animations to keep the killing fresh. Slip on one of 25 unlockable animal masks to conceal your identity and tweak the gameplay in your favor or crank up the challenge. Driving beats and brooding sounds by Sun Araw, Coconuts, M.O.O.N., Jasper Byrne, El Huervo, Perturbator, Scattle, Elliott Berlin and Eirik Suhrke. 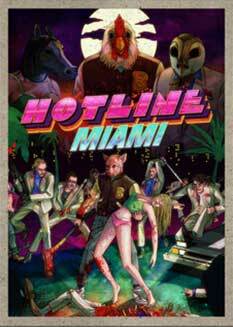 ​Hotline Miami is a high-octane action game overflowing with raw brutality, hard-boiled gunplay and skull crushing close combat. Set in an alternative 1989 Miami, you will assume the role of a mysterious antihero on a murderous rampage against the shady underworld at the behest of voices on your answering machine. Soon you’ll find yourself struggling to get a grip of what is going on and why you are prone to these acts of violence. Rely on your wits to choreograph your way through seemingly impossible situations as you constantly find yourself outnumbered by vicious enemies. The action is unrelenting and every shot is deadly so each move must be quick and decisive if you hope to survive and unveil the sinister forces driving the bloodshed. Hotline Miami’s unmistakable visual style, a driving soundtrack, and a surreal chain of events will have you question your own thirst for blood while pushing you to the limits with a brutally unforgiving challenge. You could argue that HOTLINE MIAMI is brilliant, vital, a tactical and aesthetic masterpiece as well as a pixel-art odyssey of ice-cold violence. It is. Hotline Miami is the split second between an inhale and an exhale. Polygon Hotline Miami headed to PlayStation 3 and Vita this spring. IGN Hotline Miami Developer Teases Secret Code. The Verge Pay what you want for 'Hotline Miami,' 'Thomas Was Alone,' and more in latest Humble Bundle.